The Canadians admirably accomplished their mission, enduring the most appalling conditions of mud and water, created by the German’s destruction of the dikes. 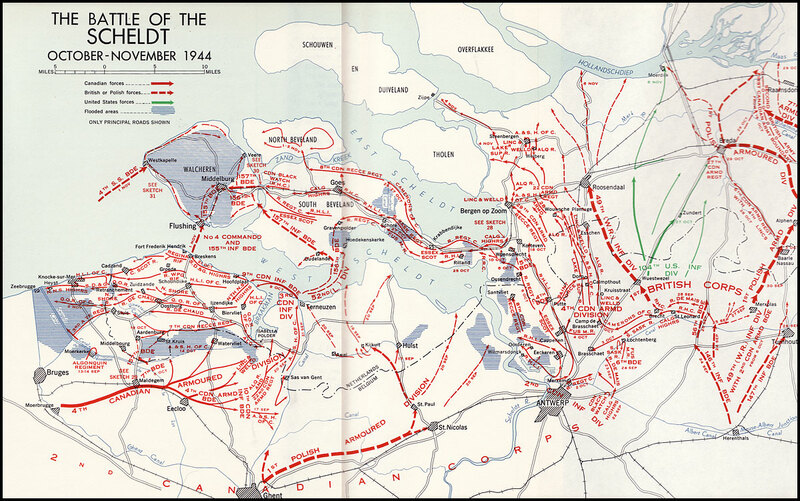 The Canadian victories ultimately resulted in the opening of the vitally important Antwerp docks. Oddly, the Canadian and Polish success in accomplishing their tasks were ignored at the grand opening of the docks, where the Americans and British were on the podium. The Canadians and Poles weren’t invited! For an explanation of our detailed itinerary policy please see Detailed Itineraries. Most guests taking this tour arrive at Schipol Airport (Amsterdam). You will be responsible to get to Bergen-op-Zoom, where the tour originates and ends. This tour, as well as our others, will be costed on the following basis. The price quoted will be for all ground transportation within the battlefield areas, with professional guid. It does not include anything else. Of course, we are happy to make recommendations to help with your travel planning, like hotels, B&B’s. There are many hotel booking sites but we have always liked http://booking.com.